NeoRecruit 4.0.2 is available ! 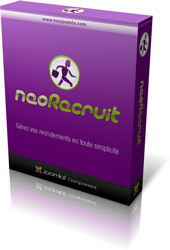 A new version of the component NeoRecruit is available, it is the version 4.0.2, only for Joomla 3.x. This new release corrects 2 bugs found in the back-office, the first in the contact form that makes it possible to send an email to a candidate, and the second in the script that sends notification emails when an administrator modifies an application. This problem was corrected with the version 4.0.1 of the component, but another bug remained. If you want more details about the component Neorecruit, you can consult the detailed card of the extension.